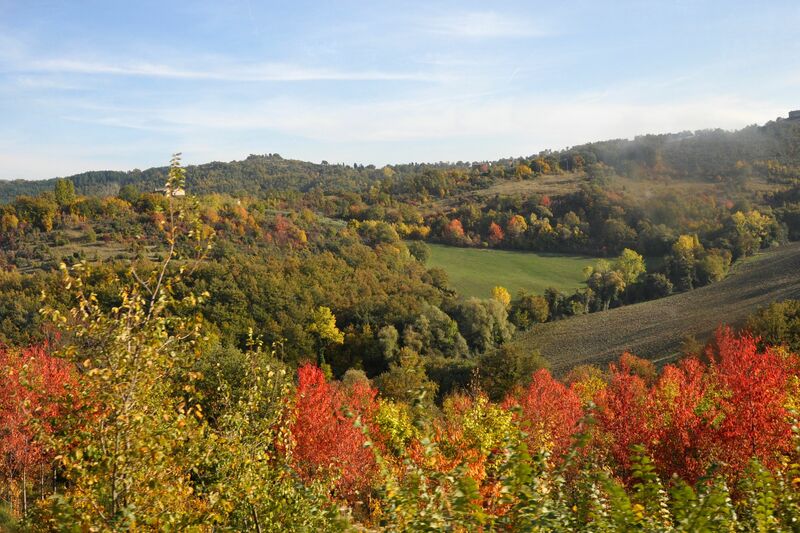 Italy in the fall: simply beautiful! Want to enjoy a view like this one? Then get to—and get around—Umbria! With its rolling countryside, fantastic food, and medieval hilltop towns, Italy’s region of Umbria is impossible not to fall in love with. What some visitors to Italy struggle with, though, is how to get there—and how to move around within Umbria once they’ve arrived. Why is this tricky? Well, we’re always proponents of taking trains in Italy, but at first glance, Umbria can be a little tough. That’s because, first of all, most of the towns aren’t directly connected to big cities like Florence or Rome, meaning you have to switch trains once or twice to get to your destination. And secondly, medieval hilltop towns means no train station in the town—instead, stations tend to be a drive away. Forget the Amalfi coast bus—the Umbrian bus is where it's at! But guess what? Despite the apparent transport hurdles, it’s easier to get around Umbria than you might think! On our last trip to Umbria, we were surprised at how well-connected the towns are. We were also surprised at how beautiful the rides were! Both the Umbrian regional train and the buses took us past gorgeous farms, vineyards, forests, and hills. Most information on how to take Umbria’s trains and buses is in Italian, however. And that’s where we come in. 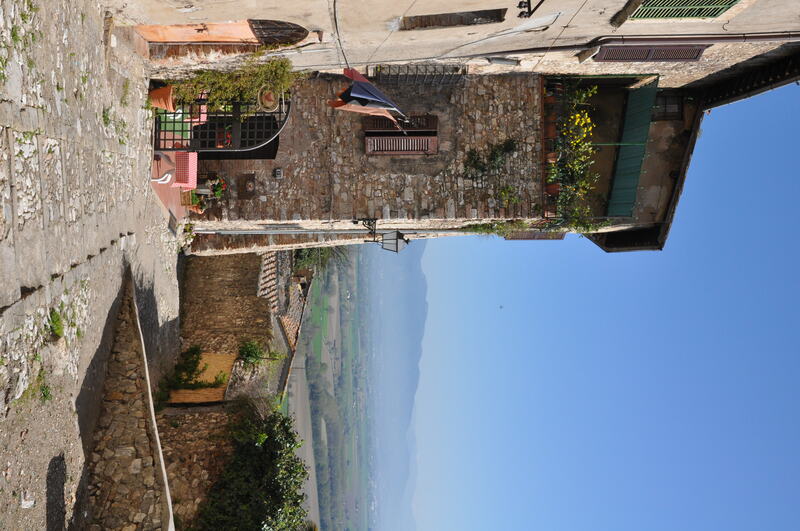 Want to get around Umbria and visit its loveliest small towns, without a car? Here’s how. This can be a little confusing. Most people are used to using the official Trenitalia site to look up trains. While the Trenitalia site shows you the stops on the national rail service, though, it actually doesn’t include some regional lines, like the one in Umbria. For that, go to this map of Umbria’s regional and national trains. The blue line represents the regional line; the black, the national line. On the left, “direzione Firenze” and “direzione Siena” mean those cities are in that direction. Same, of course, for “direzione Roma” on the bottom. That means that if you’re at any of those hubs, it’s fairly easy to hop on over to Umbria, and then switch to the regional rain. Even on the black line, you’ve got lots of options. We especially love Narni, Spoleto, Spello, Trevi, and Assisi. Once you’ve switched to the regional train, meanwhile, you can see that you can get off at even more towns in Umbria, some of them destinations in their own right, like Citta del Castello, Todi, and Perugia. For the Trenitalia trains (black line), just go to www.trenitalia.it and enter your departure, destination, and date. For the regional trains (blue line), on the same map from above, just click on the town name you want to go to. A PDF will pop up with the complete schedule. Scroll down to the page with the name of the town you want to go to, and it’s all right there. 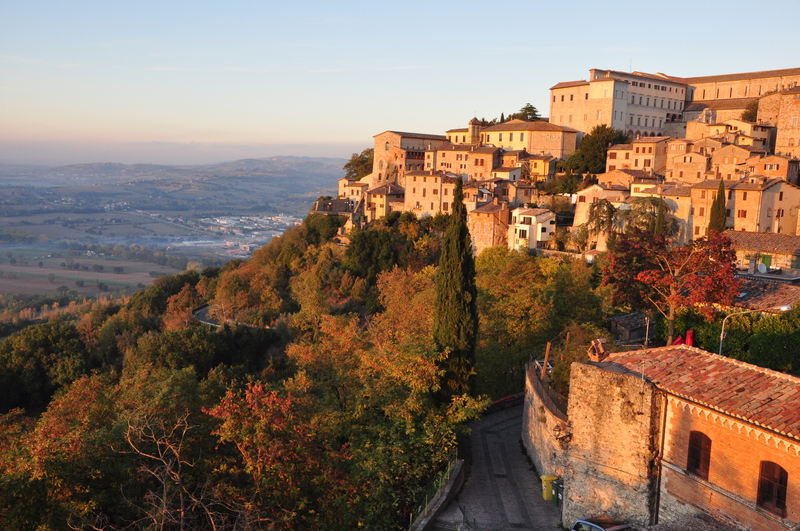 The hilltop town of Narni is beautiful—but, if you're walking, it's far from the train station, so get a bus! Often, it’s not. But that’s okay. Buses regularly run from the stations to the towns, roughly corresponding with incoming trains. (They run less often, as do the trains, on Sundays and holidays). Here’s how to find your bus: Either wait until you’re at the station and ask… or, if you want to make sure everything’s planned, go to this map of Umbria’s towns. Click on the town you want to get into. A PDF will pop up with all of the local transport (i.e., bus) options. Skim the schedules for the little blue symbol of a train on tracks; that’s your train station. Read across to see all of the pick-up times (although be aware that we’ve found that, in practice, these aren’t usually exactly followed), and skim down to see the drop-off times. Generally, we don’t worry too much about exactly which stop is the one in the center—with medieval hilltop towns, you can tell when you’re close! View from the bus from Todi to Gubbio... not bad! Not all towns in Umbria have train stations. And even those that do might have a faster connection—even from, say, Rome—by bus. So it’s worth looking into bus schedules. Sulga Autolinee connects cities, including Rome, Florence, Naples and Milan, with a number of Umbrian towns, like lovely Gubbio, Todi, and Assisi. For most other bus lines, go here. Click on the town you want to get to, and you’ll be shown even more options for getting there. For the sake of examples, let’s say I want to get to Todi (a lovely town!) from Rome. The first thing I’d do is see what trains can get me there. By looking at this same, super-useful map, I can see that (great!) there’s a Trenitalia train that goes from Rome to Terni, and then I can hop on a regional train from Terni to Todi. Yes, you CAN get to Todi without a car. Next, I go to Trenitalia’s site and see when the Rome to Terni trains leave and arrive. Let’s say I want to take the 9:50am train from Roma Termini; I’ll get into Terni at 10:39am. With my arrival time in mind, I click on “Todi” for the PDF of the schedule. I scroll down until I find, on page 13, the Terni -> Todi -> Perugia schedule, and look down the times to see when a train leaves from Terni. (They make this even easier for you by, at the top, having a section called “Coincidenze da,” meaning the trains coming from big cities that the other trains correspond with). The train from Terni onto Todi that leaves at 11:10am is perfect. There are a couple of stops in Todi, so I do a quick Google search to see which is the main station; it’s Todi Ponte Rio, and the train arrives there at 11:53am. Great! Now, though, I have to figure out how I get from Todi’s station into Todi’s center. I can call a taxi when I get there, but I want to see if I can take a local bus. Luckily, the Umbria transport website makes this easy, too. I click on “Servizi Urbani,” which brings me to this map. Then, I simply click on “Todi.” When the PDF of bus schedules pops up, I scroll down until I find the little train-station symbol, for “Staz.Todi”. The bus comes at 12:17pm, giving me some time to relax. Still, that means that the whole trip will take about 2.5 hours. Not terrible, but I wonder if I can get there faster. So, first, I check out inter-town bus lines on the same Umbria site. Buses listed here run from Todi to lots of other hubs, including Perugia and Assisi, but not Rome. So then I check the Sulga bus site. Success! “Citta di Castello – Todi – Rome” shows up on the front page. I click on “Orario Completo,” next to it, to make sure I can see everything. In the resulting PDF, on page 8, I see that I can take a bus from Rome’s Stazione Tiburtina at 4pm and arrive to Todi at 6pm. It’s definitely faster, and gets me right from Rome to the center of Todi without having to change lines—but, of course, I have to decide if arriving in the evening is okay. Have any questions about travel in Umbria, or anywhere else in Italy? Let us know in the comments! Next articleUmbria vs. Tuscany: Which Region Should You Travel To? looking at web page are the regionale trains located inside train station? are the intercity inside station? going to umbria and staying in spoleto,no car, will travel surrounding cities using public transportation. thank you. It depends on what you mean, but most train stations host both intercity and regionale trains. Use trenitalia.it to ensure that the train you want goes to the station you want! Hi thanks for the useful info! Are there any restrictions on the bag you can carry onto the Sulga bus? Not that we’re aware of, Stan. Let us know if we can help with anything else! Up-to-date information on places to stay in, not near, IN Panicale. Thank you. Panicale is an extremely small village, so we’re not sure there even are any hotels *in* Panicale! If you must stay in the town, therefore, you might consider looking at apartment/home rentals on Tripadvisor, AirBnB.com and HouseTrip.com. Please let us know if we can do anything else! Thank you so much for posting this information! I was wondering if you’d be able to provide me with some guidance… I’m trying to figure out transportation options between Gubbio and Todi (staying in the countryside outside both of these towns.) I have someone who can drop me off at either the Fossato di Vico train station or the one in Fabriano. Would it be easier to take the train or bus? I’m also open to hiring a private transfer since both locations (start and end points) are outside of town. I looked under your transfers section but it doesn’t seem like you do those… or do you? I’d appreciate any guidance you may provide. (Oh, and I think we might book the Rome-Pompeii-Amalfi Coast Tour. It looks wonderful!) Thanks! We’re happy to help! 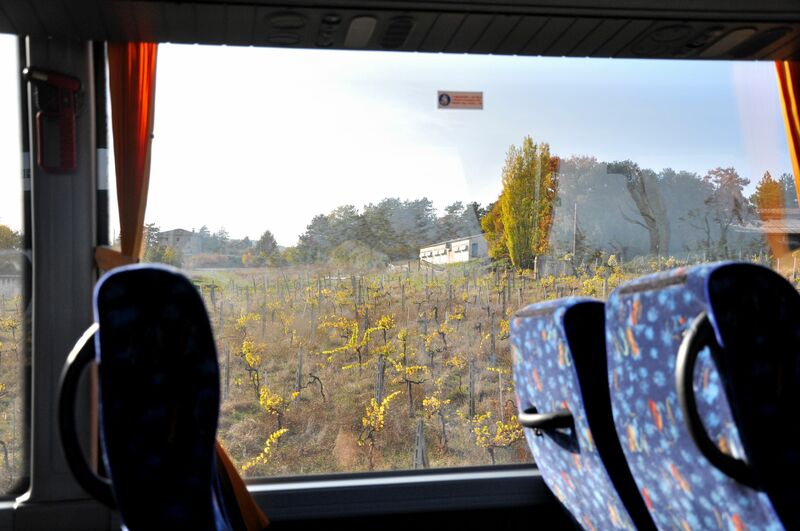 We tend to like the bus between those two locations ourselves—you get some great views of the countryside. Plus, the train stations for both Gubbio and Todi are outside of the towns, so you have to take a bus then anyway from the station into the towns themselves. But it very much depends on your itinerary! How to get from Vencie to Umbria? The fastest way is with the train, but it depends on where exactly you’re going, of course! How about Florence to Citta di Castello, and then to Rome (from Citta)? Is there any way I can ask you via email also? Thank you so much for posting this! 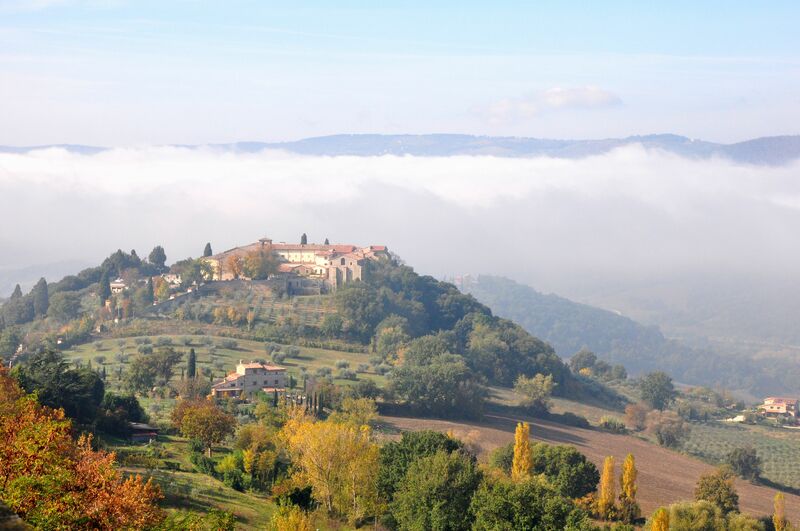 From either Florence or Rome, you’ll want to get to the Perugia P.S. Giovanni train station (you can look up times on the Trenitalia website). You’ll then want to switch to the local Umbria train we talk about in the post and take it two stops, in direction Sansepolcro, to Citta di Castello. This map will help you visualize it. And yes, if you have more questions, feel free to email us at info@walksofitaly.com! Happy travel planning! Thank you so much for posting this information. I’m trying to plan my 1st trip to Italy and Umbria and I’m going solo so I really don’t want to rent a car. I was hoping to base for a few days each in a few smaller towns, maybe Todi and/or Bevagna but I was thinking I couldn’t do that without a car. Even if I have to make a connection, the information you posted makes me think it might be doable. Thank you. We’re happy to help! And it’s definitely doable 🙂 Enjoy Umbria, and let us know if we can help with anything else! We are traveling to Umbria for a few days and leaving to go to Florence. What’s the closest train station to the toem of Umbria? thank you! It depends on where in the region of Umbria you’d like to go! From Umbria to Florence, you will probably wind up changing trains in Perugia or Cortona, but no matter where you stay in Umbria, as long as there’s a train station, you can get to Florence 🙂 Let us know if we can be of more specific help! Honestly, either one! Both are picturesque, medieval hilltop towns with a lot to recommend them. So we’d say just go with whatever one you feel more interested in, as we promise either will be perfect for photographs. My destination is Gubbio from Rome (Fiumicino) mid December. I can go to either Fossato di Vico or Perugia as then I will be met by friends. My question is, arriving at the Rome airport around noon, would it be easier to take a bus or train? I don’t speak Italian and want to keep the trip as simple as possible. There is no train station right in Gubbio, so it will probably be least hassle to take a bus directly to Gubbio. Otherwise, you can take a train to the station at Fossato di Vico/Gubbio, which is 18km from Gubbio, and from there buses run regularly to Gubbio itself. I need to travel to Citta di Castello, do you have recommendation of the easiest/quickest route? I am finding all this very confusing and need help!! We’re happy to help! You’ll find that the cheapest flights go into Rome. From there, you’d take the regional train (trenitalia.com) from Rome to Perugia, then the Umbria local train (http://www.umbriamobilita.it/it/orari/servizio-ferroviario) from Perugia to Citta di Castello. You can also fly into Pisa, which might be slightly faster but more expensive. Just to clarify….We havent purchased our flight tickets yet as we are unsure where to fly into…Pisa? Rome?. We need to be there on a Sat, so cannot fly into Perugia as not flights on that day. Thanks again. My wife and I are traveling in Italy for three months. We would like to spend two weeks exploring Umbria. What is your thoughts on staying in Spoleto and getting there from Rome? 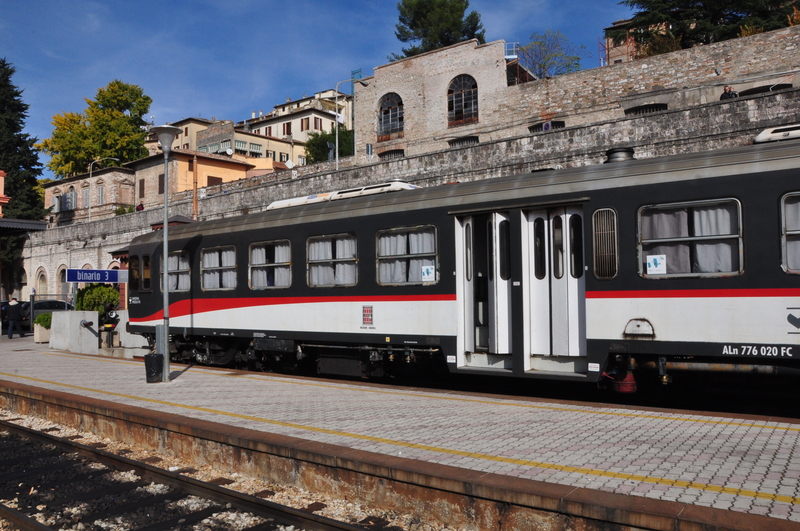 We love Spoleto, and Spoleto is accessible from Rome, on about a 1.5-hour train ride. And it can make for a great base for exploring Umbria, but remember that the train station is just outside Spoleto (it’s a short bus ride from the station into the town)—but that is true for most of the Umbrian towns, as they are medieval hill towns and therefore can’t have stations within the walls, of course! Let us know if we can help with anything else! We are 4 women traveling fall of 2014. We would like to stay for 2 days in a Agritourism farm around Orvieto .We will be coming from Florence by train and perhaps find a taxi in Orvieto to take us where we are staying(when we find a place). We would like to take one day and go to Sienna and through Tuscany either by tour or train. Then take a taxi back to Orvieto to go to Rome. Any suggestions for tour guides, place to stay or train, bus info would be great. We decided not to drive but want to see the countryside. Hi Gwyn, we have a wide range of tours and transfers available in the Tuscany area available on our website. Please do not hesitate to send us an e-mail at info@walksofitaly.com if you have any questions! I couldn’t find any train to Todi directly:( What is the nearest train station to there? Ciao! We suggest taking the APM bus line to Todi from Perugia (Piazza Partigiani), which usually takes one hour to get to the city center (Piazza Jacapone). Be sure to inquire if the bus stops in Todi: if it does not, get off at Piazza Consolazione and take local bus A or B to the city center. The one way APM bus ticket will cost you 5,20 euro. Buon viaggio and be sure to tell us about your experience! How far in advance can you look up train schedules on trenitalia? Hi Lori! Train tickets can be purchased via Trenitalia four months ahead of time. Buon viaggio and do let us know if we can help with anything else! Hi there, I was wondering the best way to get from Perugia to Fratta Todina and Todi please by Bus? Hi Tabitha, we suggest taking the APM bus line to Todi from Perugia (Piazza Partigiani), which usually takes one hour to get to the city center (Piazza Jacapone). Be sure to inquire if the bus stops in Todi: if it does not, get off at Piazza Consolazione and take local bus A or B to the city center. The one way APM bus ticket will cost you 5,20 euro. As for Fratta Todina, you can take the F209 bus from Todi. Buon viaggio! Should/can I purchase advance bus tickets from Rome to Umbria (Cascia)? Or do I buy the tickets the day itself? Ciao Len! You can purchase your tickets on the day itself or at the station the day before. Trains leave the Rome Tiburtina station at 7:30 and 15:30. Buon viaggio and let us know if you have any questions! We want to go from Spoleto to Florence. The best train changes at Foligno, but only leaves 5 minutes to do so. Is this possible? Ciao Fred, we always suggest giving yourself enough time when switching trains (usually 15 minutes) as sometimes trains can run behind schedule. Let us know if you have any questions! I am wondering if there is a train that would take me from Milan to Acona, Citta di Castello…or some town around that area where I could then rent a car and drive to La Tavola Marche? Hey, great article, thank you for your ideals in this nice post Walks of Italy. I will be living in Trestina this summer for a while and would like to figure out how to get to the center of Pergugia. On umbria mobilita I found that there is a train that goes from Trestina to P.S. Giovanni and to Sant’Anna. Do I need to make any connections to get to Sant’Anna or is the train direct? I have been searching for regional train links for a year……..thank you for the umbria link. where can i find a similar link for other regional train systems? i have the Puglia site and believe i can find the Sicily site. Any others that perhaps go along the western coast? The train that goes on the east side of lake como? Hi, we are thinking of staying in Spello for 5 nights. Is this a good base to explore Umbrian villages? I can see that there is a train station just out of town. Is there a bus service to the centre of town from the station and how regular is it? We don’t want to be dragging our cases for 1 or 2 ks? Also, is there a taxi service in Spello? Spello is a gorgeous Italian village in Umbria and it is a good base to explore other Umbrian towns. From the train station you can easily get to Assisi, Perugia, Spoleto and other destinations in Umbria. There is a bus station that takes into the town (see here: the C1) but the streets of the historic city center are so narrow, that a bus is unable to drive down most of them. That said, it seems that the train station is only 600 meters from Spello. An easy walk without luggage! Hi! Thank you for such wonderful information! This coming July I’ll be in milan; but I want to go to Perugia. How would I do it easy? Also. ..where can I see the tours you guys do? You can easily get from Milan to Perugia by train. You’ll likely take a fast train from Milan to either Bologna or Florence, and from there a regional train to Perugia, but you can see times and costs on http://www.trenitalia.com. All of our tours can be found at our website, WalksofItaly.com. Unfortunately we don’t have any tours in Perugia, but check out our Best of Milan tour, which tours the historic center, up to the terrazza of the enormous Duomo and gets you skip-the-line tickets to see the magnificent Last Supper by Leonardo da Vinci. Was wondering if you could help me route from Florence to Massa Martana station. Going to Castello di Montignano for a wedding and am told they will pick me up at Massa Martana station if I can provide them with an arrival time. The date we are going will be a Monday May 16th. Hoping to arrive between 11am and 1pm most efficiently. Ive found trenetalia trains to get to either Terni or Perugia but struggling with times connecting Florence from either station to Massa Martana. Not sure about bus options. Thanks in advance. 1) Go to Perugia a bit earlier and stay there the night of the 15th, as it’s a wonderful place to visit — we highly recommend it. Then you could take the buses toward Massa Martana with plenty of time to spare in case something goes amiss. You’re right, that link is no longer available. Perhaps this map might help you a bit. When it comes to day trips, you’ll likely get the best, most up-to-date information on the ground from the locals. For example, whether it’s better to visit Città di Castello by train or by bus!